Trigger finger blister and misses on paper target! Sophie asked, "Is there a connection between the blister I get on the pad of my trigger finger and the fact that so many of my hits are on the left edge of the center of my paper target? My finger gets really sore. And I get really tired of seeing how many misses I have! Oh, and I use a Glock." Mabel says, "Yes, there could well be! 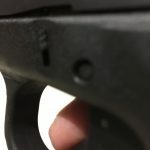 If the middle of the pad of your finger isn’t squarely on the trigger, actually on top of the tab in the middle of the Glock trigger, you may well be pushing your shots to the left! And doing this repeatedly could easily cause a blister. The trigger tab on the Glock trigger must be depressed and this happens as you press the trigger straight, flat back. 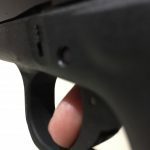 If your finger is not squarely on top of the tab, but on the side, it will still eventually depress, but your finger is sliding across the edge of the tab and this makes the blister and causes you to push the muzzle to the left during the shot!